Icellars Estate Winery is a boutique winery located in beautiful Niagara-on-the-Lake. It was founded in 2010 by the ICEL family. Small batch wines are produced from the farm and inspired by classic winemaking styles deeply rooted in the history of viticulture and winemaking. 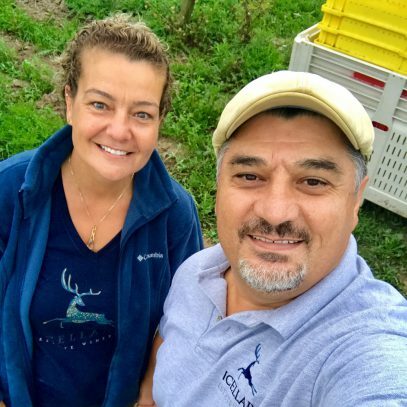 The 60-acre fallow land was carefully selected by owners Adnan and Elif ICEL based on precise research of ideal growing conditions for premium vinifera varieties Cabernet Sauvignon, Merlot, Cabernet Franc, Pinot Noir and Chardonnay. The winery uses estate grown fruit from their hand-manicured vines. Total yearly production is currently around 4,000 cases with plans to increase slowly with new plantings. The vineyard has a very warm microclimate suitable for big reds and Chardonnay. Chardonnay is the only white grape planted on the estate. The winery is focused on high-end wines with 100% of the wines are aged in French oak barrels from 12 months to 24 months. The winery building is designed to be zero carbon footprint with gravity flow winemaking. Adnan Icel is the owner winemaker of Icellars. He is a Mechanical Engineer by profession who spent 30 years in design and construction. He didn’t know much about wine 9 years ago. He does not have a formal winemaking education, but he is so keen to learn and practice winemaking. He is living his dream he cannot think anything other than wine now! He designed the winery building, winery equipment and built them. He chose the grape varieties and planted them. He can be spotted mostly in the vineyard tending the vines or on his tractor, during harvest he is everywhere around the winery. Their chardonnay is made in the vineyard. They do everything by hand in the vineyard. They do shoot thinning, cluster removals, leaf removal on the morning side, hand sort and hand pick their grapes. Being in a cool climate, their main goal is to keep refreshing acidity with lively fruit tones in their wines. After picking they do another round of hand-sorting on a sorting table and put the whole clusters directly in a press. They always ferment their Chardonnay in French Oak barrels until they reach full dryness and thereafter do full malolactic fermentation. They do lees stirring meticulously for 12 months. With refreshing acidity and creaminess & butteriness coming from barrel fermentation and aging, it is best of the both worlds.